When I received an apple slice cakelet pan from Nordic Ware for apple week, I got right into the kitchen to experiment! The pan is the most darling pan to use for fall baking! I personally will use it all year round because it is a great baking tool! Finishing up Apple Week with these amazing apple cakelets is a pleasure for me. The first batch of apple cakelets I made was eaten in no time! I knew I had a winner because even the hubs, who is not a sweets person, ate quite a few! I have made these countless times and the family loves the apple cakelets. 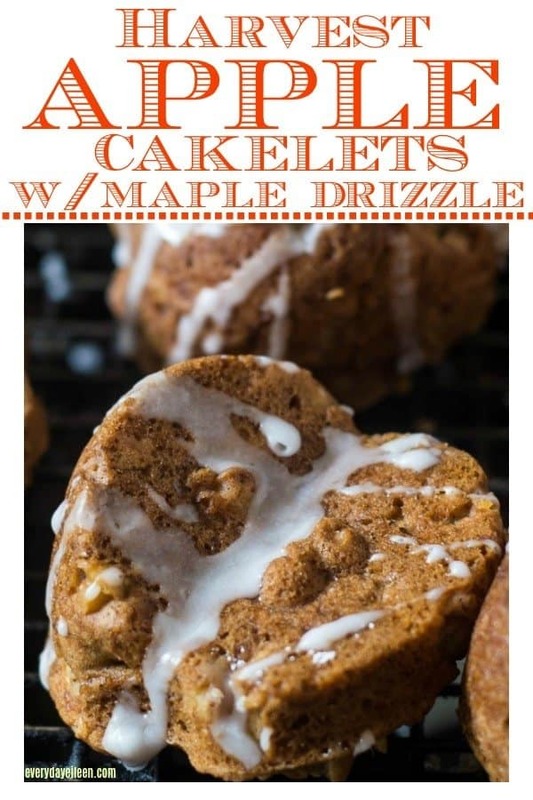 Topping the cakelets with a Maple Drizzle sends these tasty treats over the top delicious! Where can I order a Nordic Ware Apple Cakelet Slice Pan? You can order one of these pans to use for fun autumn/Thanksgiving desserts HERE! 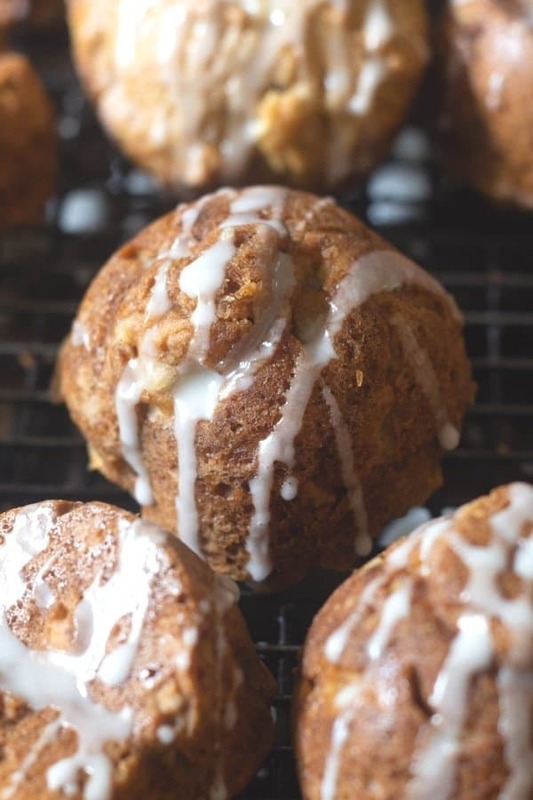 Can these Apple Cakelets be made ahead? Yes. This is a perfect baked treat to make-ahead. Do not add the maple drizzle. Wrap each cakelet in plastic wrap and place in a freezer safe bag. When ready to use, defrost overnight in the fridge. These can be warmed in the oven at 200 degrees for a few minutes. Then add the maple drizzle. In a medium bowl, add diced apples and sugar. Give the apples a few minutes to absorb the sugar. Preheat the oven to 350 degrees. Spray the cakelets pan with non-stick spray. Set aside. To the apples, add coconut oil, egg, and vanilla. Blend well. Sift flour, baking soda, salt, cinnamon, ginger, allspice, and cloves into the apple mix. Add in walnuts. Scoop about 2 Tablespoons into each cakelet. Use a spoon to even off the top of the apple cakelets. Place in the oven for about 20 minutes. Toothpick should come out clean. Let cool and top with the Maple Drizzle. Enjoying these apple cakelets, giving it a 5-star rating and any comments below always are very helpful for me and so much appreciated!! 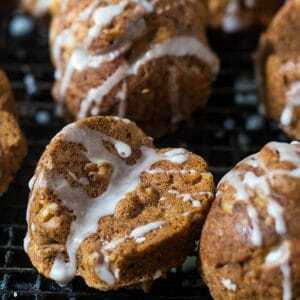 Delicious cakelets that are perfect autumn desserts. Use Nordic Ware cakelet pan to make mini cakes with leaf imprints and apple slices. These can also be made in muffin tins. Preheat oven to 350 degrees and spray the Nordic Ware cakelets with non-stick spray. Set aside. In a large bowl add diced apples and sugar, and coconut oil. Let the sugar absorb into apples about 5 minutes. Blend in beaten egg, and vanilla. Sift into the sugar mix the flour. baking soda, cinnamon, salt, ground cloves, allspice, and walnuts. Mix to combine. Scoop into the cakelet wells, 2 scoops each. Tap the tops with a spoon to smooth the tops. Fill each cavity about 3/4's fill. Bale about 15-20 minutes. Toothpick should come out clean. When cooked through, remove from oven and let muffins cool on a cooling rack. One cakelets are cool, drizzle the maple drizzle on the apple cakelets. In a small bowl, combine confectioners sugar, water, and maple syrup. Whisk to combine ingredients. 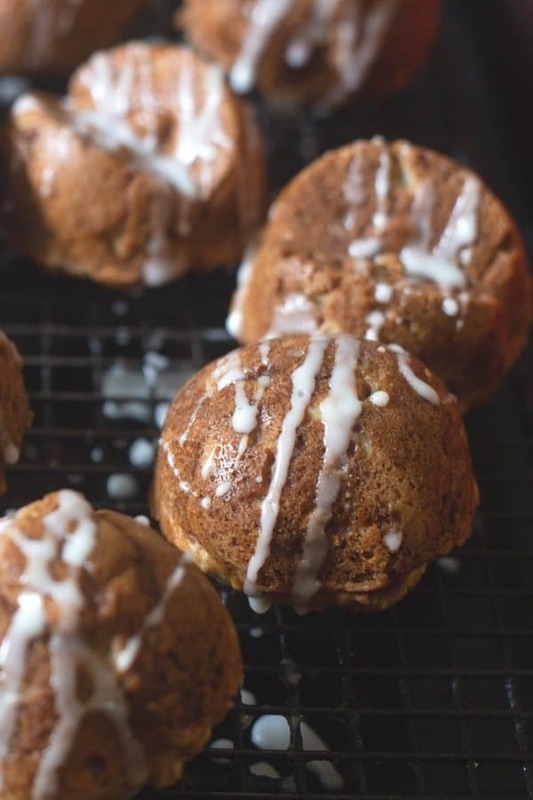 Drizzle on apple cakelets. Note 1: Melted butter or canola oil can be used in place of coconut oil. Note 2: Please do not use pancake syrup. 100% pure maple syrup only. Maple extract can be used in place of maple syrup. Note 3: If a cakelet pan is unavailable, these make wonderful muffins. Yummy! These cakelets look so good! I bet that maple drizzle is to die for! Will definitely have to make these! Thank you Amy! They are so good! I am making a ton for Thanksgiving and bringing to the family! Everything about this sounds delicious! We pick so many apples in the fall, it is nice to have some good recipes to use. And that maple drizzle sounds divine! Awesome Marysa, enjoy the recipe! Yes, the maple drizzle is delish! Perfect recipe for this time of year. The apple and maple go together like peanut butter and jelly, and who doesn’t love the adorable shape mini bundlets make?!!! Thank you so much Sara. I love this pan too! I love these fun little bite size treats! Thank you so much Wilhelmina! I hope you enjoy the cakelets! Such a great pan…those cakes are perfect for a fall get together. Thank you Wendy! I LOVE my pan and I hope everyone gets one!